There has been a great deal of discussion, for many years, about the lack of women in science and technology and how to fix it. Although I haven't been able to find any actual studies or surveys on the topic, I'd like to propose a hypothesis: The lack of women in science and technology begins with a lack of science fiction when they were young. Although mainstream media and pop culture view geek/nerd society as male-dominated, there’s a long history of female involvement in fandom. Women have played an original or integral part in significant scientific and technology related discoveries and inventions that pre-date any organized fandom or science fiction/comic book related social clubs. Wonder Woman was the first superhero character created to be a role model for females in comic books. Her first appearance was in 1941. She was aimed at an existing audience of female comic book fans. The Oxford Dictionary of Science Fiction dates the coinage of the term “fem fan” or “femme fan” as early as 1944. Both articles prompted me to reflect on my role not only as a geek woman, but also as a geek mother. They resonated particularly strongly since I'd recently begun introducing science fiction stories to my eight-year old daughter. Here's the rub, though: she's too young for stuff like STAR TREK, STAR WARS, and SPACE BATTLESHIP YAMATO, likes stories with humor, and prefers girl protagonists. So how exactly did I spark her interest? ALL AGES PANEL- A HEROESCON TRADITION! KIDS READ COMICS TOO! Moderator JIMMY AQUINO (COMIC NEWS INSIDER) is joined by MIKE MAIHACK (Cleopatra in Space), CHRIS SCHWEIZER (the Crogan series), ANDY RUNTON (Owly), JEREMY WHITELY (My Little Pony), STEPAHNIE GLADDEN (Peanuts) and THOM ZAHLER (My Little Pony) to talk about their amazing comics. They’ll discuss why they went into this genre and if there is a difference between “kid’s comics” and “all-ages comics”. We went for the MY LITTLE PONY component (my daughter's a big fan! ), but discovered a lot more than expected. It was a terrific panel with an insightful discussion, including topics such as the rise in popularity of kid comics and diversity in comics. You can listen to a podcast of the panel at Comic News Insider. At the 54:33 mark, Mr. Aquino looks at my daughter and asks, "Do you have a question?" You can hear her in the background saying, "No." LOL! What can I say, she was busy just taking it all in. In fact, the discussion was so thorough I didn't have any questions myself. Everyone on the panel was warm and engaging. I'm thrilled my daughter's first convention panel was such a positive experience. 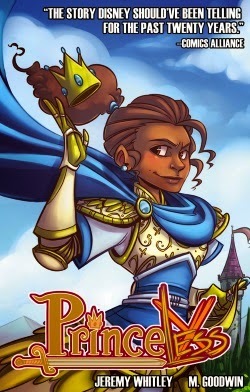 We learned about two genre comics with girl protagonists that are geared toward kids her age, so after the panel we marched straight to the dealer's room and bought Mike Maihack's CLEOPATRA IN SPACE and Jeremy Whitley's PRINCELESS (fantasy action-adventure story, but who's counting?). Autographed, too! 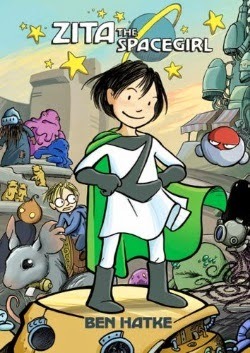 Shortly after the convention, I discovered Ben Hatke's ZITA THE SPACEGIRL comic book series thanks to Amazon's "also bought" feature. How Awesome That My Local Library Carries It! So I scooped 'em up. 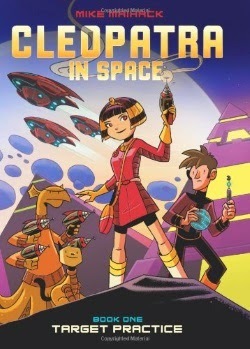 Because CLEOPATRA IN SPACE and ZITA were my daughter's first foray into literary SF, I asked her if I could read them to her (and also because I was keen to check out the stories myself!). I'm impressed with the storytelling quality and love, love, love the fact that these girl heroines have so much agency. They're not perfect, either--they make mistakes and have to face the consequences. Additionally, some of the humor is laugh-out-loud funny. My daughter has also read a FRANNIE K. STEIN: MAD SCIENTIST book or two in the past few months and via Amazon Prime she's currently glomming MY LIFE AS A TEENAGE ROBOT. It's kind of amazing how all of these stories came into her life around the same time. And the really neat part? My daughter is seeing the connections between the math and science she's learning in school and the content of the SF stories. Plus, she's excited about being able to apply her knowledge! Very gratifying. Are there any parents out there who'd like to share how they first introduced their daughters to this genre?